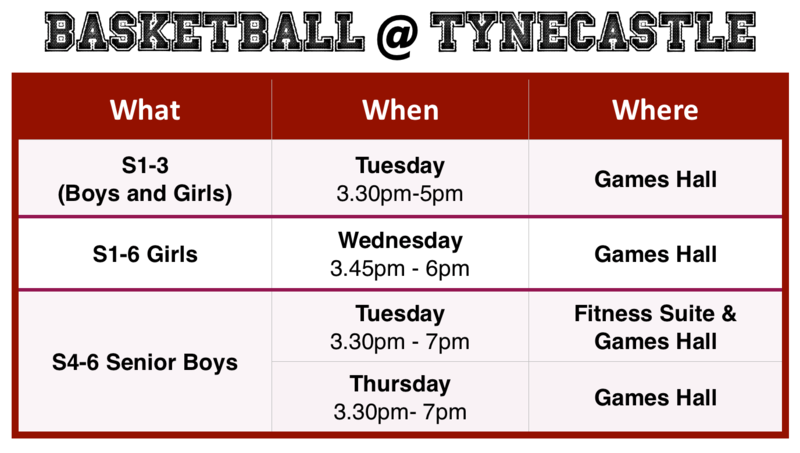 Over the last three years basketball at Tynecastle has become one of the most popular after school activities and we are very lucky to have a qualified coach delivering all the training sessions. Through basketball we aim to allow young people to work together in a challenging, dynamic and fun way. Many of the skills the students work on during training are transferrable: confidence, teamwork and communication to name a few. They are encouraged and motivated throughout the sessions. We hope that this develops into a lifelong enjoyment of sport. The teams compete in Basketball Scotlands Cup and Plate competitions as well as playing regular friendly games throughout the year. S1 – 3 teams also have the opportunity to play in local Active School competitions and 3 v 3 tournaments – a huge thank you to the coach, table officials, referees and, of course, the players who help make this all possible. Game information will be posted on Twitter. We also give students opportunities throughout the year to attend professional games with teams who play in the British Basketball League or National Basketball Association. These opportunities allow players to witness the game being at the highest level and see the strategies and techniques used by the professionals. If you are interested in joining any of the basketball groups please see Miss Moyes or Tom Griffin for more information.